Regression therapy is great for a lot of things. I particularly like to use it when signs of regression are already occurring in the client. Whenever people have problems in the present, related to something that happened in the past, regression is a possible approach. However, it’s important to avoid false memories. Why is regression so useful? Because if we can broaden perspectives on past events, change the emotions that resonate with those past events, then the client may change their emotions and behaviors in the present. As an example, if a client gets depressed when someone criticizes them, and then lashes out at the criticizer, you may be able to trace that feeling back to a time they were criticized as a child. As an adult looking back, they may have a different experience of the event. Or, you can help them gain a different perspective by bringing resources from other areas of their lives, into the old experiences. Once those old experiences are reprocessed and have shifted for the client, they will respond differently in future situations in which they’re criticized. I usually use an affect bridge technique, which has a lesser chance of creating false memories. I prefer to work with regression that meets the following guidelines. There is a feeling/behavior, in a specific context that occurs in the client’s life and they’d like to change it. The client doesn’t suggest regression or recovering memories to me. Your frame of mind has a lot to do with what comes up when you do a regression. In other words, you tend to find what you’re looking for. With the affect bridge technique, the client is feeling an emotion and looking for the earlier instances where they felt that same emotion. It’s best if the client’s expectations are neutral. Often they’re surprised by the memories that come up, but those memories are not “repressed.” They might say, “I’d forgotten about that,” or “I haven’t thought of that in years.” Those are good signs. Or at first, they may not see how those memories are connected to their current situation. You may be able to, but they may not. Those are all signs that an agenda has not clouded the responses they’ve given you. But what happens if a client already has an idea of what they might find? So, let’s suppose you read a book by a prominent psychiatrist that said that many cases of psoriasis could be traced to childhood trauma in which the person was abducted by Martians. In hypnosis, if that person were to be asked to find the root cause of their psoriasis, it would be easy for them to imagine that they were kidnapped by Martians. Since the imaginations are more vivid in hypnosis, they might think the imaginings were real. That’s one way false memories can be born. This scenario might seem ridiculous to you, but it’s not far from things that people have actually believed. And if the therapist takes the client’s imagery at face value, they may begin to develop a theory and lead other clients in that same direction. They may say, “Don’t be alarmed if you see images of Martians, it’s happened to dozens of my clients.” Then, the clients who don’t see Martians are characterized as “resisting” and a new theory springs up — that the Martians are programming them not to remember, even in hypnosis! Now, as a hypnotist, you are never going to be able to know everything that’s in the client’s mind. They might have a theory or an agenda that they don’t reveal to you. But you can avoid most of the problems with regression therapies, including false memories, by following a few, simple guidelines. 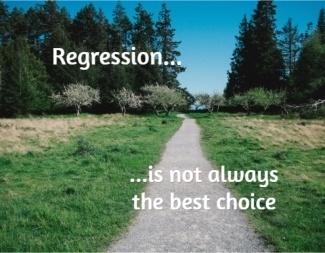 When someone calls and asks for regression, I always carefully examine the reasons they think regression is suitable for their situation. If they want to recover a memory, (unless they lost a brooch somewhere and want to remember where they put it) I usually pass. The reason? They usually already have a theory and are looking for confirmation. That’s a perfect situation for creating false memories. I had one situation where a couple came to me for “help with memory problems.” It turns out that the woman was blacking out and disappearing for several days. The husband wanted her hypnotized to find out what she was doing when she was gone. He believed that hypnosis was like a truth serum and she wouldn’t be able to make something up. That situation was a minefield for a hypnotist. I declined the session. PS: If you want to discover potent, effective, fast NLP and hypnosis regression techniques — check this out.